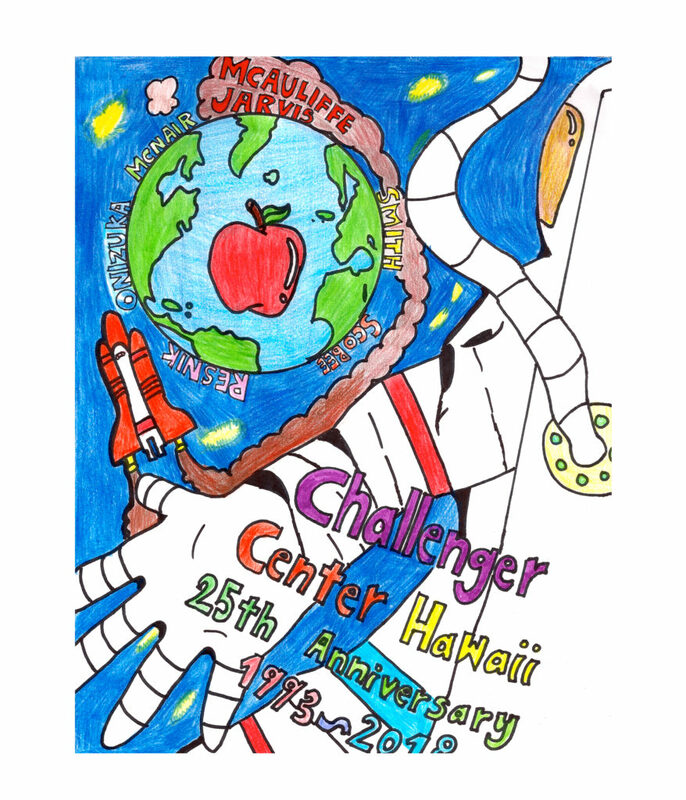 The mission patch contest for Challenger Center Hawaii’s 25th anniversary was a blast! 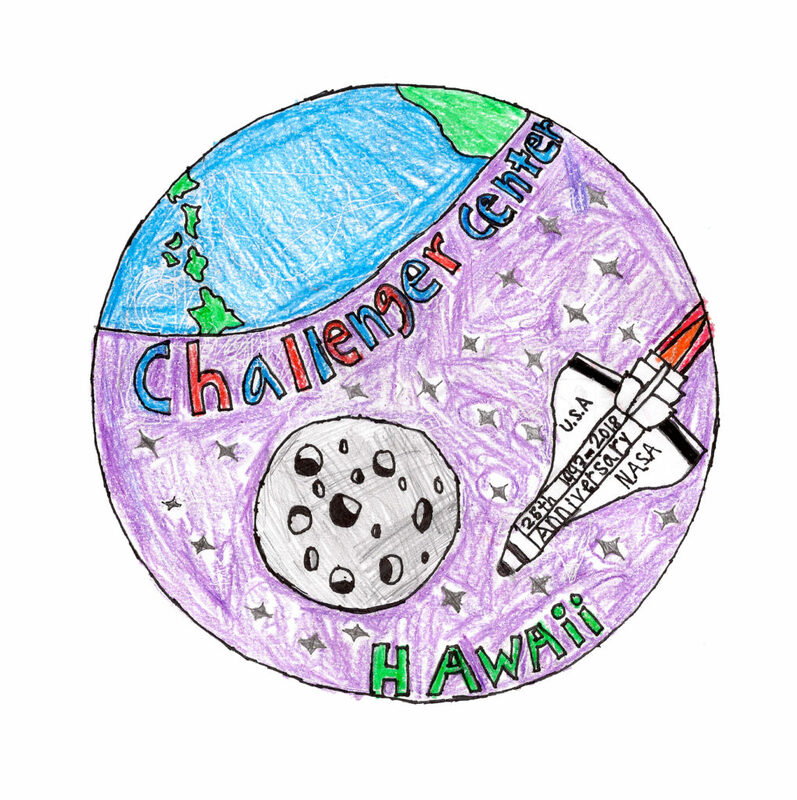 Here we showcase a mission patch from each of the participating schools. 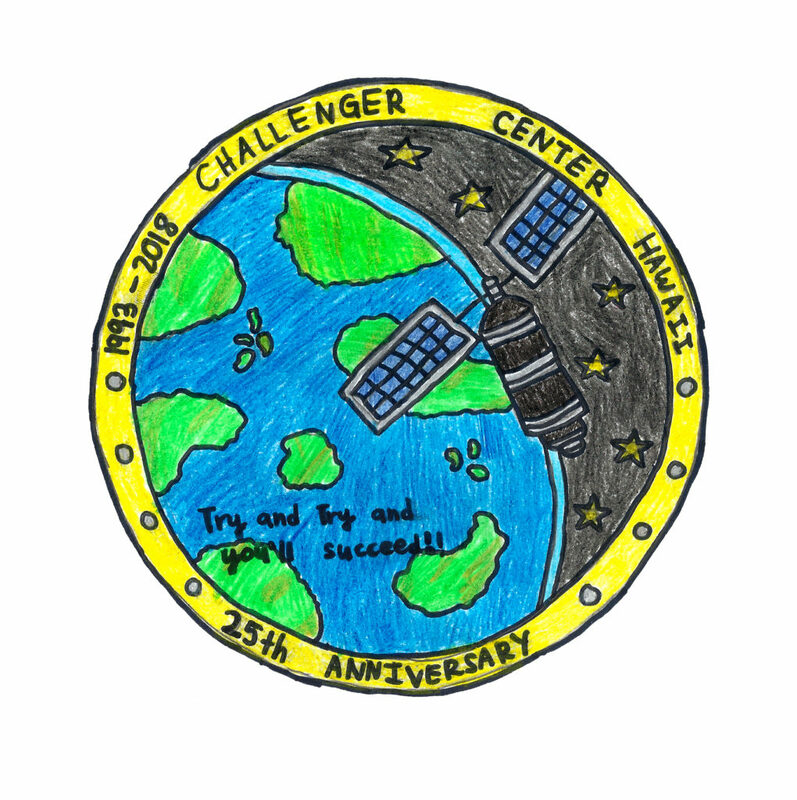 You can also see the results of the mission patch contest here. 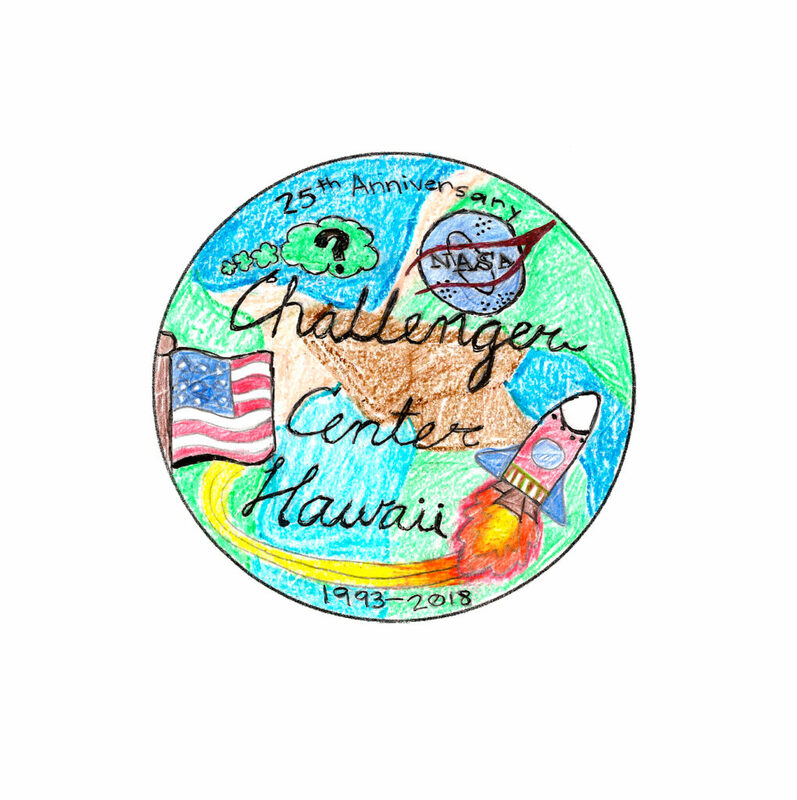 The patch I’ve created represents Challenger Center Hawaii’s 25th anniversary. 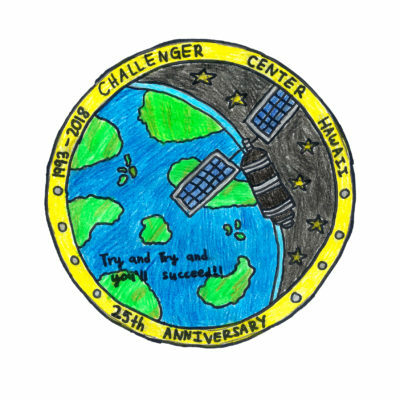 On my patch I drew the Earth because that is our home planet and it represents where the 7 crew members from Challenger came from. 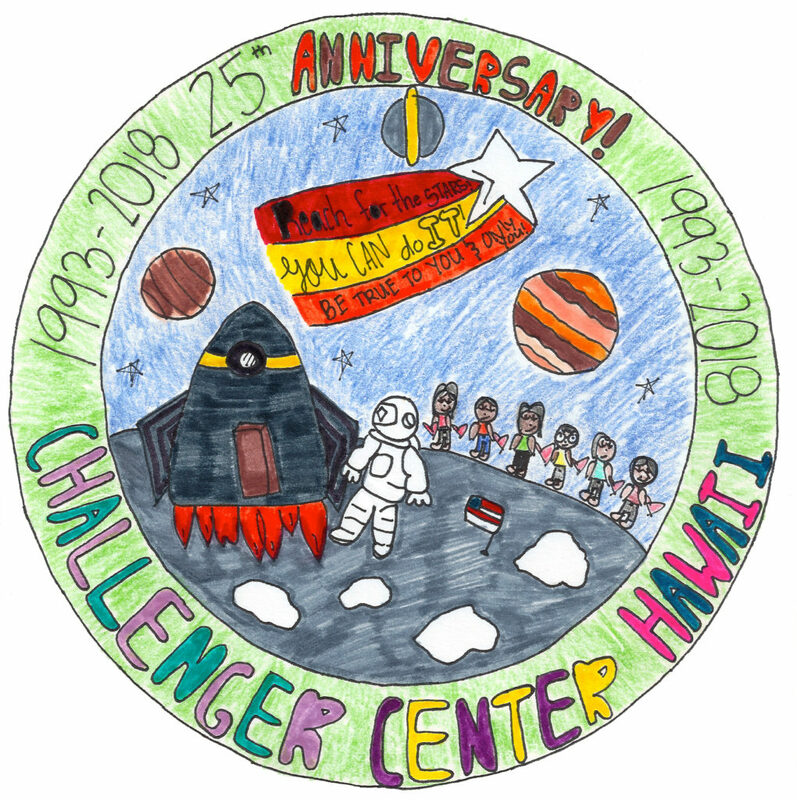 You can also find the Challenger space shuttle actually accomplishing their mission. I also put a quote from Christa McAuliffe, one of the crew members and a teacher that passed on the Challenger on January 28, 1986. Lastly, I put the 50 stars to represent the 50 states of the United States of America because some astronauts came from different states. I’m Maleah Caesar from Major General William R. Fort Shafter Elementary. I am in sixth grade. 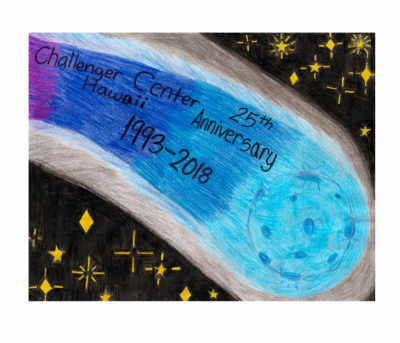 For the Challenger Mission Center Hawaii Drawing Contest, I drew a comet in space with an ombre tail and glowing stars around it. Around the comet, it is gray to show that the brightness of the comet is reflecting on the darkness of the area it is in. The stars are there to put designs in the artwork. The black is there to represent the darkness of space. The comet’s tail colored in an ombre to make it look pretty and stylish. This entire artwork was done with colored pencils and a sharpie. The sharpie was used to write the words on the artwork. The colored pencils was used to color everything. The mission of Challenger Center Hawaii is to make sure that on mission day students are overarching their goal. Their goal is to complete all the tasks and meet the primary objective. This will be expected to be done without any mission-compromising mistakes. 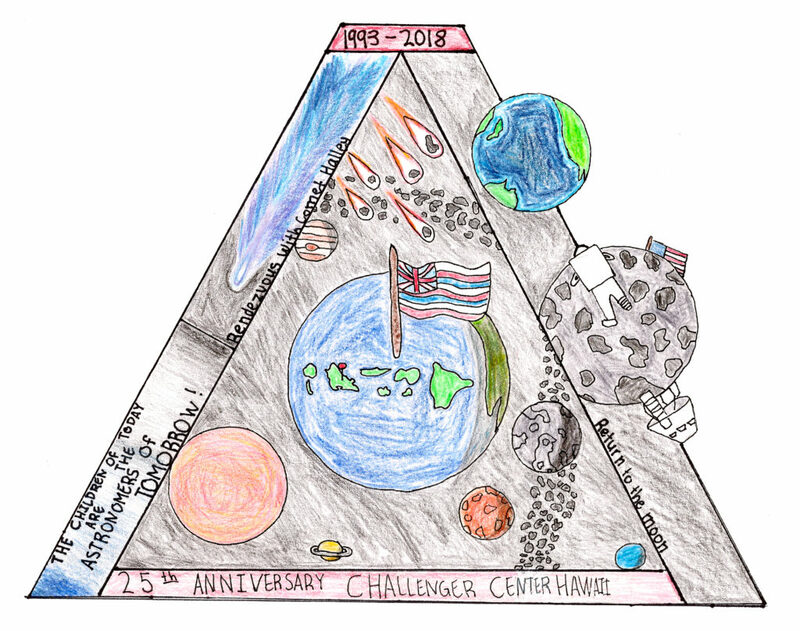 The reason I drew this picture goes along with the mission of Challenger Center Hawaii. The reason I drew this is to show that students should always achieve their goals and keep reaching out and trying until they get to where they want to be. For example, my drawing shows a comet flying in space. This comet is probably trying to get out of space and go towards Earth. This comet is not going to let anything get in its way of achieving its goal. If this comet can do it, so can the students on their mission day. That is what I drew and why I drew this picture. I worked very hard on this artwork. I really hope I get in the top three in this drawing contest. Mahalo! 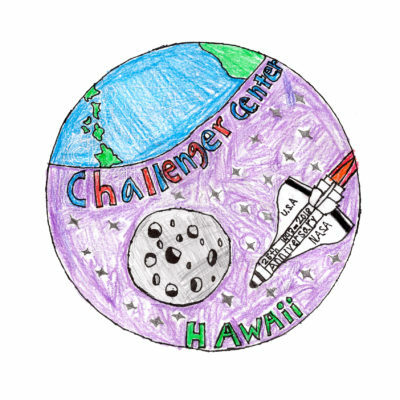 My mission patch contains some objects our solar system has to offer and the missions that Challenger Center Hawaii has. Around the Earth I drew the Sun, the Moon, Mars, an asteroid belt, meteorites, Jupiter, Saturn, and Uranus. For all of the planets I shaded in a section of it to make it a little more realistic. 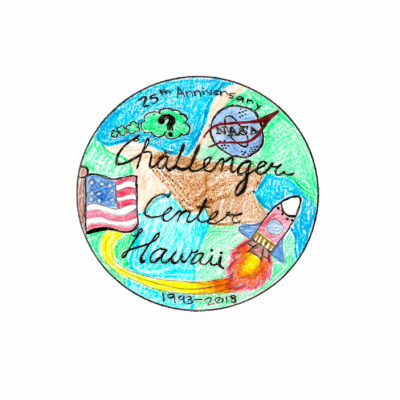 I added a red pin tac pointing to the location of the Challenger Center Hawaii I also added the Hawaii flag waving in the air and the pole pointing towards the Hawaiian Islands. Above the Earth I drew meteors to fill in the spaces. On each side of the patch I drew the two missions that Challenger Mission Hawaii has to offer people that visit, Return to the Moon and Rendezvous with Comet Halley. In Return to the Moon, I drew a space shuttle lander to show that they made it to the moon, the U.S. flag that Buzz Aldrin and Neil Armstrong set down, and an astronaut looking at Earth and realizing that they completed their mission. 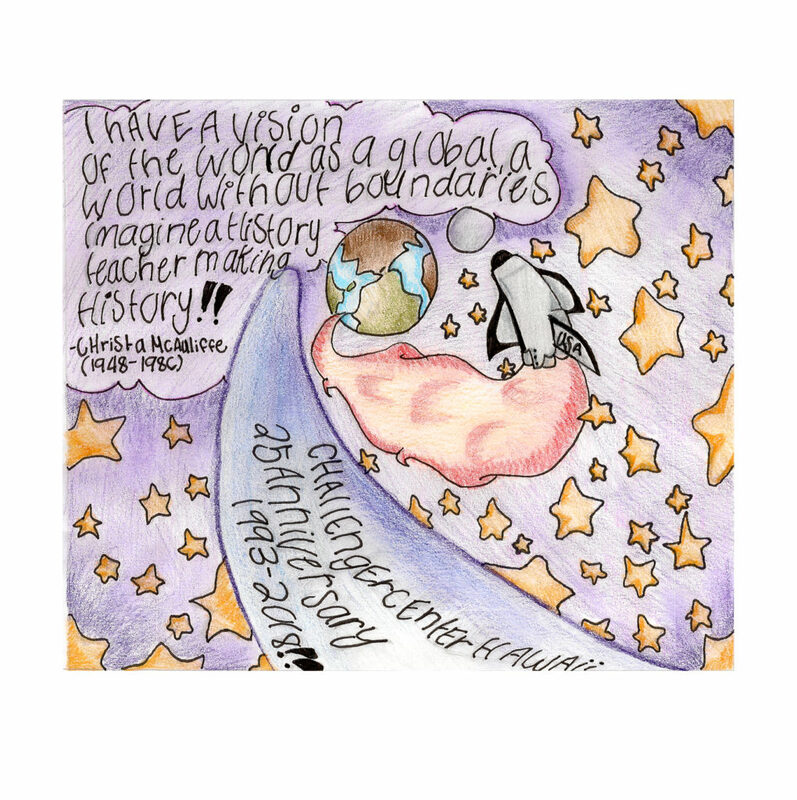 In Rendezvous with Comet Halley, I drew a picture of Halley’s Comet along with inspiring words for future astronomers. 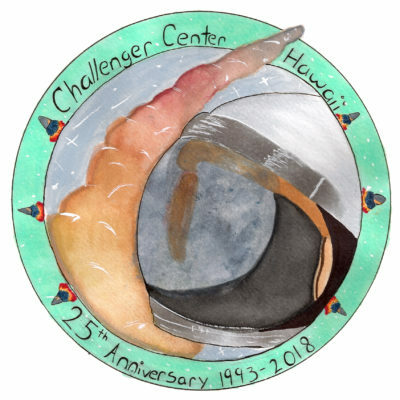 My patch includes the things that I find interesting and exciting about space, as well as Challenger Center Hawaii’s cool and fascinating missions. My mission patch represents the 25 years of teaching students about many amazing things in space. This mission patch also represents many wonderful things in space. I really enjoyed learning about astronauts, and how they communicated, thanks to 25 amazing years of teaching. This mission patch represents that our curiosity can lead us to great places. Not only our curiosity, but all our knowledge and the effort we put into our goals. We may be on Earth right now but if we work our way up to the top then, we can achieve big goals and maybe even go up to space and create history. This patch is of an astronaut’s space helmet. In the reflection of the space helmet is the Moon and behind the helmet is a rocket ship leaving Earth. As a space explorer I created my Mission Patch symbols because of many reasons. First, the shooting star is an example of how you have to reach for the stars and especially to follow your dreams! 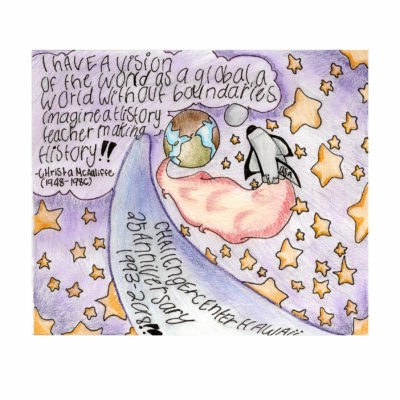 Moving forward, the students or children on the moon explains how they aspire to be an astronaut. Just how the astronaut is on the moon getting ready to leave and go on to his next mission, the children are reminded of their goals and accomplishments. After thinking of my symbols I had to figure out a shape, a shape that means something. I finally chose a circle because in that circle we all are inspiring and working together as a team coming full circle as one. On my Mission Patch, I also picked colors that stood out to me the most. For my background, I decided to go with BLUE because to me I feel that blue means to always trust your team members, even if it means someone may agree or disagree with one another. Moving on to the next color that I chose, it was for my shooting star and I chose the colors RED, YELLOW, and ORANGE, and for the star I made it white. I picked these colors because red, tells me that you always need to love and encourage your teammates and to go beyond their limits. Furthermore, yellow reminds me to have happiness and to have fun with your teammates, and lastly orange represents to have calmness with one another. For example, if you are running out of time on your mission, I would say to stay calm and have a positive attitude. Lastly, the star is white because to me it means to have peace between your team members, even though you don’t get along well you guys should have peace and always show respect for one another. As we go into the mission, fail or pass we will always remember to push each other and to inspire others to do our best! In closing, I would like to say that the overall goal or message was to inspire others who aspire to obtain their dreams to work hard and never give up. Aspire to Inspire others and we can make this world a better place. This patch represents that you succeed your mission in the space and you went back to Earth safely. Inside this patch is the Earth and satelight the reason why I put this things because I’m trying to discribe that the astronauts that they succeed the mission in the satelight, and that mission is to make sure that there is no asteroid coming to Earth.